This is a welcome addition to the Oxford Handbooks in Nursing series and is essential reading for any surgical nurse or allied healthcare professional. Key features of this evidence-based book are numerous. It is light and pocket-sized, and the format puts access to essential surgical information at your fingertips. It draws on a wealth of contributors and experts in the field of surgical care. The book is presented in a logical and progressive format and covers patient care from diagnosis through to discharge and rehabilitation. Essential information around documentation and consent is also covered. To take some examples, chapters 5-8 deal with pre-operative optimisation, chapter 16 explains the importance of phlebotomy/blood cultures and chapter 17 reviews each body system. Key references and suggestions for further reading are given on almost every page. Particularly useful features are essential guidance on common blood values and a body mass index ready reckoner. I cannot recommend this text highly enough. I would go so far as to say it is one of the most fundamental contemporary resources for health professionals working with surgical patients in any speciality and for students of surgical nursing at any level. 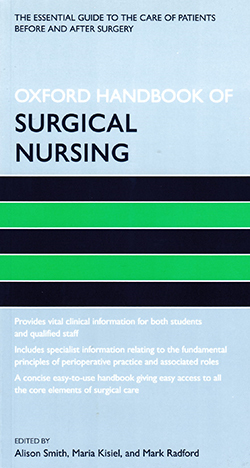 It should be at the top of any student reading list, used by novices and advanced surgical nurses alike and certainly as an aide-memoire accessible in the clinical environment.